Residents of a remote Alaskan village will find out Wednesday if they are to become the first American community to become climate refugees. 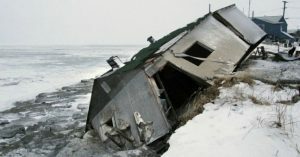 Rapidly rising sea levels are forcing the 650-person village of Shishmaref, which lies just north of the Bering Strait, to consider relocating. Residents voted Tuesday and the city clerk said that results will be announced Wednesday. As for where they will go, the community will decide later at a town meeting. The move is estimated to cost $180 million. Shishmaref is just one of four Alaskan villages identified by the Army Corps of Engineers in 2003 of being in “imminent danger from flooding and erosion and…planning to relocate.” Since then, dozens more communities have been added to the list. But as Robin Bronen, a senior research scientist with The Institute of Arctic Biology at the University of Alaska, recently explained to Yale 360, there is currently no funding or government institution set up to help facilitate such relocations. One of the consequences of not having that institutional relocation framework is that when communities make the decision to relocate, that community will no longer be able to access funding for capital projects that every community in Alaska is eligible for. That money then becomes available to other communities… So what winds up happening is communities are left with deteriorating infrastructure, and there’s no mechanism to take the money that the community would normally have access for fixing that infrastructure and have it be allocated instead to a relocation site. Another Alaskan village facing imminent relocation, Kivalina, had no potable water for several months in 2014 because erosion was affecting the infiltration of their water system. That community, too, is stuck in limbo. The Obama administration had proposed $50.4 billion to help with Alaska Native Village relocation efforts, but that only covers a portion of the estimated cost of one community’s move. In 2001, my people voted to relocate along the coast of mainland Alaska, but the estimated cost is $200-250 million. The reality of moving is very complicated. There is not enough funding for relocation efforts. And even though we made this decision, everyone wants to stay — especially the older generations who have spent their whole lives in Shishmaref. But we realize we have no choice. It really hurts knowing that your only home is going to be gone, and you won’t hunt, fish and carry on traditions the way that your people have done for centuries. It is more than a loss of place, it is a loss of identity.